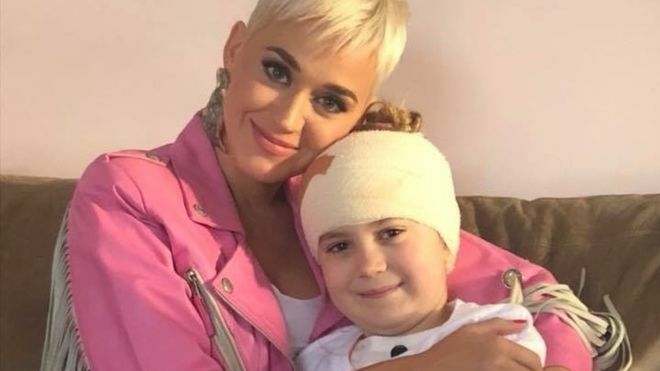 Eight-year-old Grace Moores had brain surgery last week after being told she had a 6cm tumour. Her sister Tiana, 16, tweeted that Grace had been looking forward to the concert before she was diagnosed in April. Katy’s team got in touch with Tiana and went round on Tuesday before her concert in Adelaide that night. Katy has since posted video of their meeting, with the caption “The Power Of The Internet”. Katy asked Grace to name her three favourite songs, and then performed an acoustic set for her with two guitarists. “She sang Roar, which is Grace’s all-time favourite, and Firework and Chained to the Rhythm.” And while she was there Katy also took one of the greatest snaps of all time. Katy shared a clip of her with the family to her 71 million Instagram followers.